Twinsen wrote: Apart from the fact that's it's a nice tree view, the mockup explains nothing about the details. One of the virtues of the tree view is that it doesn't need explanation. What will people do when they see a tree view? They will left click and expect to select or open. I'd prefer select-for-placing-ghosts. People will also right click to see what further actions are available. No need for a wiki to explain shift-right-click to empty, mouse-wheel-scroll, and all the other weirdness that causes users to repeatedly lose their blueprints until they have a few hundred hours of Factorio muscle memory to protect them. Blueprints just wanna be files. Books just wanna be folders. Blueprint items (rare but valuable) just wanna be symlinks. The blueprint library button will be disabled until bots are researched or until any item is added to the library for the first time. I have highlighted the second part because some people here can't read. It means that for players who already have blueprints in their libray, they have access to blueprints right at the beginning of a new game, because the library is shared between games. So it is not locked behind any research, that is only true for NEW players which don't have any blueprints at all. NIronwolf wrote: I couldn't stand the hand drawn mockup I had on my longer post. Here's a better one. If you compare your makeup with the one on reddit you can see that it has indented item names, which gives it much more visual clarity than yours, where all names have the same indent. I think you should change it to indented names and place the icons after the names (if you even need icons, because they are useless for blueprints anyways in my opinion). Otherwise i think thats looks great! @Factorio devs, I think the tree file explorer is the best design, but if you are still going for the grid design, at least show the blueprint names under their icon (like in windows folder view), because having to mouse over every blueprint to read their name is a total waste of time. Twinsen wrote: Allow books in books: this makes shift+scroll up/down strange. Shift+scroll up/down is bad anyways. Lets say i have to scroll through 10 blueprints to select my required blueprint. That means i have to scroll, look at the blueprint, scoll, look at the next blueprint times 10. How long does that take compared to a single look at the tree? Yet, i still use the blueprint scroll in the current version. Why? Because clicking directly on a blueprint in the book will pull that blueprint out of the book, and later i press Q and it gets dropped in my inventory, messing the entire blueprint book up. Once you fix that issue, i will never use Shift+scroll up/down again! Last edited by Azzinoth on Tue Jul 10, 2018 12:26 am, edited 2 times in total. Is there a red tread to spot in our posts for you as devs? And is is reasonable to implement? Which are the limits of our imaginations? Perhaps when more rules and shared ideas (of unanimous accordance) are set out clearer and more specific questions can be formed and awnsered. Now we just trow up our workflows in the hope they will be taken in account. What do we have so far in in summary, and what options can be scraped? First of all, blueprint library and blueprint books will not have this list of blueprints. It will have a grid similar to the one in inventory, so you can arrange the blueprints better. Ok well, That would work in your inventory for grouping active blueprints, but i agree with A2: mixing books and folders will become confusing, but that leads to an other conclusion: we have to solve the A1 problem, since since we need the books in the library to behave as folders to make a tree. We need to be able to place them inside each other. Is removing the key bind a option?. A book (with only a grid inside) makes it feel as an item, because of it' s simplicity. Any file system i know uses folders, so books will be expected to behave as a folder when building your hiarchical library. But what is the difference between a book and a folder structurewise? The way of displaying/viewing (grid/list) is far beside the issue if we are not even sure if books can be placed in books. I do not agree that grid is better to arrange blueprints, i think that we would prefer multiple layers of sorting over the mess of a two level hierarchy of all our sets of blueprints. A grid is nice for storing and grouping multiple blueprints but not for searching by X. Maybe adding/removing rows/columns and being able to rename them could possibly buff the grids a lot in their useability. Of course there are small problems and gotcha's, last years been invested in making a great game, not in developing a great ui, that time is now, time to put the cherry on the pie. Should users care if blueprints are items or system if they can use them how they want to. Do they have to be real items to be placed in chests etc? We could diffentiate between blueprints (read/write) and linked copies (read only). -Linked copies can be made in real game item from a blueprint. -Linked copies can' t be reassigned (They are read only). -Only linked blueprints (linked copies exist=true) are needed sharing on a server " library"
Having a game lib is essenially what we need, if we can put both our factory prints and show-off prints in there. That could replace the current system and be much more clear at the same time. I think being able to put books in books and having treeviewer to read this hierachy and your position in it would be a great step in the right direction. But without the right direction defined it is hard to give the right awnsers. What are the questions in the current/prop 0 idea of having items? Are those questions problems or unknowns. How far is it from reasonably practical in the means of coding? Most of the times a single FF give enough thoughts to not seen back for a long time, but having a multiple week session makes me feel we're taken seriously and is really interesting. Since we patiently waiting for the Fluids update we sure have another weer to spare for this topic, which is clearly an important topic where we love to give our feedback so dont hesitate for a follow up. Hey everyone, not sure if you seen this, there's this great reddit post I thought was worth mentioning. Seriously though, it's a good idea. I'd rather see the blue prints as items worked around this concept, than try and work trees and folders into an item grid. I think the difference here is that the grid is linear (in 2D) whereas the directory suggestion is fractical, and fractical works much better with the development and catogorisation of ideas. Which is why we see the same pattern used for mind maping software as well. Twinsen wrote: By making players share items, organise them in chests, protect them, it leads to way more emergent situations that can be fun in multiplayer. "where is the steam engine blueprint? it's in a chest next to the boilers, use that to build more". By making players do extra work to share blueprints, it leads to people only using their own blueprints and never sharing. "Where is the steam engine blueprint? I got it off reddit, go find your own. Can you believe these lazy newbies nowadays?" Also, whatever emergent situation you're imagining would be easily bypassed by sharing chat links to blueprints, or even sharing web links to blueprint strings- if someone can skip walking to the chest by asking for a link, they will always ask for the link instead of walking to the chest. Now we are spamming the chat for something we used to do instantly and silently. So skip the chat and just share everything. Twinsen wrote: But it's quite probable that in multiplayer games there will be a separate "game" library that all players can add and remove blueprints from, so that can cooperatively build that game's blueprint collection. If you have to explicitly add blueprints to the game library then every game library will have the insane person's never-built 1,000,000 electric furnace blueprint, a book of train blueprints that mixes left-handed and right-handed tracks, and nothing else. Maybe this idea would work if every print that was pulled into the game from someone's private library got automatically added to the game library, but at that point why not just share everything? For me the multiplayer games have a tendency to get very similar with almost the same blueprints thrown down. Removing automatic sharing can maybe lead to more dynamic games with more variation and more player interaction. Embrace others building style and the chaos in open multiplayer or play single players or with selected friends. I can use mouse and/or wasd to navigate the grid and use space to select the blueprint and close the dialog, selecting a book goes down the hierarchy, there is a button (and hotkey) to move up the tree. There is also a searchbar that another hotkey activates (make that one consistent across all dialogs with a searchbar) to filter, will optionally search recursively into the tree. Why are you holding to those books so bad Twinsen? Books were introduced when blueprints were clogging inventory space badly. When books were not enough library was introduced. Every tool has its roots and there is no shame in changing paradigm. When we are talking about tree structure books can be completely replaced with folders especially in the case of blueprints no longer being items books lose their purpose completely. So A3 is real. Folder can act as a book no matter if it has sub folders or not. You can still scroll through it. The only question here is the order of enumeration of subitems. It is even more beneficial as you can not only link the folder to your hot bar but also share it using both text export string and chat link and you can share a selected part of your library in this manner which can include several sub levels. And importing player can dedicate a folder in his library for this import and not mix this big stock of blueprints with his own. PacifyerGrey wrote: Why are you holding to those books so bad Twinsen? There is a high probability, that books will work like folders. When reusing the library grid code for book grids, preventing the storage of books inside books would need additional work without gaining any benefit. So i expect that we get recursive books regardless of the first implemented view. As soon, as recursive books/folders arrive i will organize my blueprints as modset->structcategory with optional game phase as another hierachical level. Thinking more about views: We could use a hybrid view with a book/folder tree left of the view displaying the items of the selected book/folder - like in the Windows file manager. The items view should be switchable between grid and list (for few items or when icons are not enough to differentiate between items) views and memorize last used view for each book/folder. The compact grid view is perfect for lots of blueprints featuring descriptive icons (production stuff, balancers, most train stuff...). The list view is perfect for items where four icons as a description just don't cut it (complex multi-goods production, whole bases, complex train-stations...). In my library, for most stuff four icons are descriptive enough. But there are ten to twenty (only that few because i am somewhat creative with the icons) blueprints of wich i have to read the name to be sure that i get the right one. Maybe I'm too used to DVCS (git), but version control would solve the last two items nicely. mooklepticon wrote: Have y'all seen this reddit thread on blueprint menu? I prefer it to blueprints as items. Why are they items, at all? I understand why they were items previously, but I think they can be abstracted, now. Quoting this because I feel it would be the best solution to the blueprint problem. Azzinoth wrote: Shift+scroll up/down is bad anyways. Lets say i have to scroll through 10 blueprints to select my required blueprint. That means i have to scroll, look at the blueprint, scoll, look at the next blueprint times 10. How long does that take compared to a single look at the tree? Yet, i still use the blueprint scroll in the current version. Why? Because clicking directly on a blueprint in the book will pull that blueprint out of the book, and later i press Q and it gets dropped in my inventory, messing the entire blueprint book up. Once you fix that issue, i will never use Shift+scroll up/down again! Exactly. Shift+Scroll is one of the first things a new blueprint system should try to improve. Just 10 BP's make a book tedious to use. Whatever new system gets selected we have to be able to select the BP through "random access" instead of "linear search with zero lookahead". Shift+scroll at the moment is like a narrow keyhole we are peeking through. Just showing the grid or list is a first step. Even if you still had to scroll to get to the BP you would at least immediately see how far you have to scroll. But selection by mouse would be much better. Since you already have your eye on the right BP you can point to it really fast, that's how the mouse works best. And I would be outright happy if additional to a fast selection by mouse you could select any BP by a keyboard sequence. I.e. if a grid is used, maybe add chessboard digits on the sides and select a specific BP with 'N' '8'. Or with books in books 'A' '6' 'N' '8'. Okay, okay, that is just icing on the cake, but Shift+Scroll has to change. I vote very strongly for tree view with subfolders. As for scrolling through the books - I like the ideas mentioned like just going deep level first. Also the idea to have a gui pop up with a list to select the print. Atm books can hold 1000 prints if I remember correctly but have you ever tried scrolling through these? It gets tedious fast. Also I need the desciptive names in text. I simply can not think of a good use of icons on them and I am constantly hovering over all prints to find the one I am looking for. Takes up much of my playing time. And for taking away shared blueprints in multiplayer I can not disagree more. See lastly a new player asked about how to build his first trainstation. I showed him in the world and invited him to look at several railbooks I had afterwards. Scrolling through them he asked what those wires were for. Ten minutes later he built his first own circuits. I would never have showed him these stations to not confuse him and it would have taken so much longer until he discovered it. Another friend of mine would never show me his in his opinion probably for me to complicated builds - only If I would ask specifically(which I can't not knowing they exist). He would also never place them in a chest for anyone, just because he likes to build everything from scratch - every time. Yet I got so much ideas from looking at his prints. Learned tricks. Discoverd parts which I never used before. Really just don't take it away. For me it is one of the things I love about multiplayer as it starts conversations. We almost never use ingame chat btw. We are in audio chat always. I strongly hope that your console command does not mean you can't get achievements for a save as I tend to reinstall factorio everytime in a new folder for each modconfiguration so I can choose which one I update and which one I don't. Which means that from the games perspective I am a new user on every play. Getting the achievments on a save is a lot of fun. I therefore would love a mapconfig option as well. More freedom to choose for everyone. On the other hand blueprint menu allows to have submenus, while you can't put books into books... Useful if you have a big blueprint that consists of multiple parts that you would like to place separately(I don't want beacons until I have enough power), or maybe switch between them(I want to place assemblers 2 for now, but later I want to switch to assembler 3 with modules). I remember in one of threads about UI there was mention of World of Warcraft UI. That's how I would like Factorio to be - you have essentially 'spells' on your toolbar, completely separate from your inventory, which when 'casted' put item from your 'backpack' on the ground. That way toolbar can be separated from inventory, which IMO is very desired, because you can make toolbar work with 'blueprint spells' (which wouldn't be 'items' in your 'backpack' anymore), which allow far more flexibility with new blueprints implementation. Ok. So i'm probably the last guest to this party. Much has already been said. But i felt that a picture says more than many words. Didn't have too much time, so excuse the rough mockups. Personally i think that the "manage lots of small things" is a problem already adequately solved by todays file system explorers. And the "search" problem is imho solved by browser bars. So my ideal BP Library would combine the best of two worlds. I've never used the BP library much because it truncates all my carefully chosen blueprint names and forces me to search through a heap of symbols, hovering over every single print to finally find what i want. So my main concern is ofc...FINDABILITY. Dear Devs: Is this a huge heap of work? Yes. But i sincerly believe that different view modes for different people is the best - or maybe even the only - way, to please the maximum amount of players. If we get a tree structure reflected in file system, why not allow other file types such as text notes (.txt) and pictures, and call it just Library instead of Blueprint library? You can still dedicate folders to serve as blueprint books but players will be able to add some custom data to the library helping them sorting and sharing data. That is the best idea of this thread. And there has to be full modding support - so we could indeed have upgrade planners in our libraries. -UI should allow for toggling showing names of books and blueprints beside them (similar to operating system file managers). Icons and picking which row you put them in is not enough for organization. This type of management is tedious and not necessary. What I would do in this situation is use one row for each category of blueprint books, like one row for trains. Now what happens if you have 5 rows each for a different category next to each other. 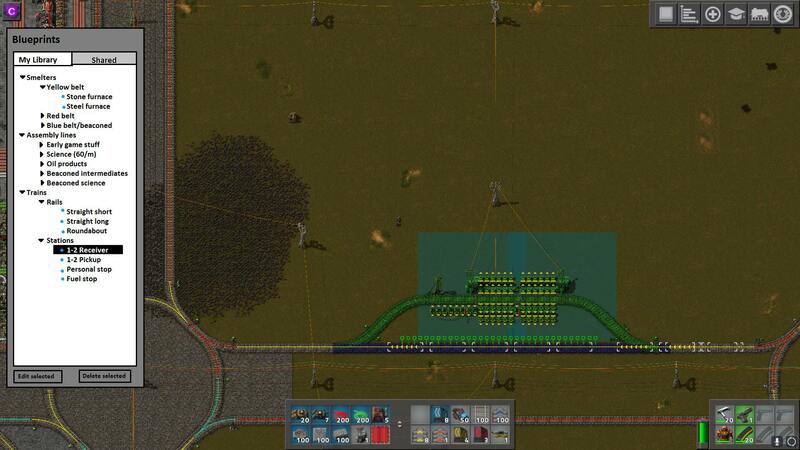 Now you add another train blueprint book but your train row is full. Now you have to manually shuffle all the other books down by one row if you want to keep your train blueprints in the same logical order relative to other categories. Even if you move your train blueprints down to the bottom to avoid shuffling too many blueprints, now you have an empty row which is confusing, complicates what happens when you add new books (why is there a blank row? ), etc. Honestly this manual organization is just bad. Give us directories/categories and have it auto sorted. Then if we want to change the order of a category, we just give it a different name that shows up earlier when sorted. I talked about some of this stuff in friday facts 249 post in more detail when the blueprint proposals were discussed. I also really would love the file system type approach. It was well described by a post above with screenshots.